Stamford, Conn.—Stamford is joining the ranks of leading-edge cities across the country as it launches the Stamford 2030 District, an initiative of 23 property owners and community and professional partners working toward the goal of cleaner and greener commercial and other large-scale buildings. 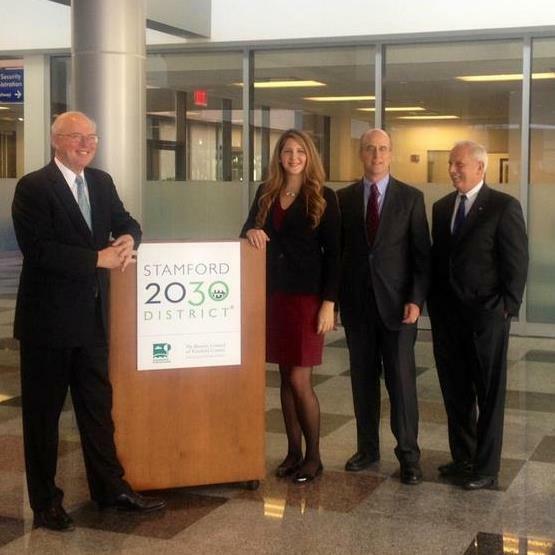 Megan Saunder, executive director of Stamford 2030 (second from left) is joined by Don Strait, president of CFE (third from left) and other founding partners at the launch. Photo credit Laura McMillan. Not surprisingly, the built environment—commercial and municipal office buildings as well as multi-family housing—is a large consumer of natural resources and generator of emissions. “This initiative will further strengthen Stamford’s commitment to combat the effects of climate change,” said David Martin, Mayor of the City of Stamford. 2030 Districts, initiated by the non-profit research organization Architecture 2030, are unique private/public partnerships bringing property owners and managers to meet the energy and resource reduction targets of the 2030 Challenge for Planning, while providing a business model for urban sustainability. Through collaboration, leveraged financing, and shared resources, they benchmark, develop, and implement creative strategies, best practices, and verification methods for measuring progress towards a common goal. Currently the cities of Seattle, Cleveland, Pittsburgh, Denver and Los Angeles have established 2030 Districts. Stamford is the first city in New England to establish a 2030 District. “On behalf of Architecture 2030 and the 2030 Districts Network, we applaud the drive and initiative of Stamford’s partners as they strive to collectively and voluntarily meet the challenges confronting our urban landscapes,” said Edward Mazria, Founder & CEO of Architecture 2030. The Connecticut Fund for the Environment and The Business Council of Fairfield County began working with key corporate leaders and experts in energy efficient architectural design in early 2013, to explore the potential of a 2030 District in Stamford. It immediately became apparent that, with many older buildings, in an expensive energy market, facing climate change, sea-level rise and more severe weather events, property owners faced a choice. They could reinvest in the city’s commercial and multi-family housing stock and continue to reap the benefits of a great geographic location or they could simply try to maintain a status quo, in effect, accepting inevitable declines in value. Through support provided by The Kresge Foundation, The John Merck Fund, The Vervane Foundation, and CEFIA, the Stamford 2030 District has gone from design to launch in seven months, establishing a Stamford presence, hiring an executive director and building a network of founding members. We are pleased to announce the 23 founding members of the Stamford 2030 District are a network of 12 property owners and managers (The Ashforth Company, Aquarion Water Company, CBRE, Charter Oak Communities, City of Stamford, Ferguson Library System, First County Bank, JLL, New Neighborhoods Inc., Reckson – a Division of SL Green, Jonathan Rose Companies and the Unitarian Universalist Congregation); eight community partners (The Business Council of Fairfield County, Connecticut Fund for the Environment, Connecticut’s Green Bank/CEFIA, the Connecticut Chapter of the American Institute of Architects, Downtown Special Services District, the Interfaith Council of Southwestern Connecticut, SoundWaters, Inc. and Sustainable America); and three professional partners (Connecticut Light & Power, Starwood Hotels and Resorts Worldwide and Steven Winter Associates, Inc.). The Stamford 2030 District, with the support of our founding members, will be able to apply the national standards of the 2030 Districts, utilize the most up-to-date technology, and work with our utilities to meet measurable standards of decreasing the effects of climate change. The Business Council of Fairfield County is a member-driven organization, providing a wide range of services to Fairfield County based firms, including legislative advocacy, economic development initiatives, networking programs, leadership training and more. Connecticut Fund for the Environment and its bi-state program Save the Sound work to protect and improve the land, air, and water of Connecticut and Long Island Sound. The organization uses legal and scientific expertise and brings people together to achieve results that benefit our environment for current and future generations. CFE/Save the Sound lobbies in Hartford to affect environmental policy, defends environmental protections in the courts, and directs on-the-ground projects that repair damaged habitats, reduce burdens on infrastructure, and create local jobs. 2030 Districts, an initiative of Architecture 2030, are designated urban areas committed to meeting the energy, water, and transportation emissions reduction targets of the 2030 Challenge for Planning. Led by the private sector, 2030 Districts represent over 140 million square feet of commercial buildings in downtown business districts working to reduce greenhouse gas emissions at a district scale, realizing the benefits of multiple building owners, operators, and occupants working together to share resources, leverage financing, and implement collective strategies. • the regional development of an adaptive, resilient built environment that can manage the impacts of climate change, preserve natural resources, and access low-cost, renewable energy resources.